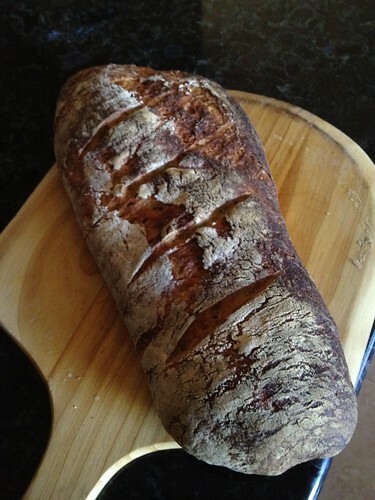 I’m a fan of rustic loaves – for the longest time I had been using this no-knead bread dough recipe – it’s a fantastic stand-by and I know it will turn out a wonderful loaf…but a while back, a friend of mine gave me a portion of her sourdough starter. Since all living things need a name, mine is named Eliza. She usually lives in the fridge in hibernation, but every now and again I fetch her out, pour off her hooch and prod her back to life. In preparation for Thanksgiving, I figured I should work on turning out some nice rustic sourdough bread. Instead of following the king arthur recipe (where I learned all about the care and feeding of my starter), I opted to give another recipe a try – I was looking for something that didn’t require kneading – mostly because I hate dragging out my stand mixer and I wasn’t up for a vigorous kneading by hand. I wound up using quite a bit more water than what is called for in the recipe (an additional cup) to get the dough to pull together into a slack and shaggy dough. After reading through all the comments, I suspect 1) my starter is not fed at the same ratio that the author’s is and 2) the use of commercial flour rather than whole grain/home ground flour also greatly affected the water:flour ratio. Since I didn’t have any bread flour on hand, I also added a couple tablespoons of vital wheat gluten. 1) Mix all ingredients together well in a large container to form a shaggy dough. 2) Cover the container, and allow the dough to double in size – approximately 12 hours. 3) Scoop the dough out onto a work surface and fold it over on itself twice. Return it to its container and allow it double in size again – approximately 2 – 4 hours. 5) About an hour before you are ready to bake, place your baking stone on the middle rack of your oven, and place either a heavy cast iron pan or some other heavy pan (not glass or ceramic) on the bottom rack. Preheat the oven to 450. 7) bake for 40-45 minutes or until a deep golden brown. I suspect the time could be reduced as far as 25-30 minutes based on some other bread recipes – the key is the internal temperature, which should register around 190°F on an instant read thermometer. 8) the hard part: Allow the loaf to cool completely before cutting it! This bread stores well cut-side down on the counter…but if yours tastes as good as mine, you won’t have to worry about storing it for long! *I use a blend of unbleached-all-purpose flour and white whole wheat flour.